Plasma Window™ - Aquarium DVD, Fireplace DVD, Blu-Ray & Plasma Art DVD Screensaver. ON SALE! The #1 AQUARIUM DVD. Fish, koi, eel, a shark tank & more! The 9 tank "Plasmaquarium Vol. I". ON SALE! The Plasmaquarium Vol. II Ultra Coral Reef DVD featuring 11 spectacular scenes all shot in HD. ON SALE! The Art Plasma Vol.III DVD. LEONARDO DA VINCI'S masterpieces turn your TV into a virtual art gallery. ON SALE! The #1 FIREPLACE DVD. Perfect for the Holidays. Plus bonus Ocean and Waterfall scenes in HD! ON SALE! The Art Plasma Vol.II DVD. Monet, Renoir, Van Gogh and more Impressionist masters on your T.V. The Ambient Fireplace DVD you can use year round! 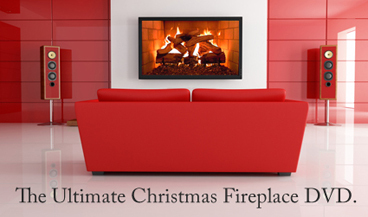 The Plasmavironments™ Fireplace DVD is the DVD that gives you more than just a fireplace. Enjoy roaring flames, a soothing waterfall or the calming rhythm of the ocean, and it comes with 4 Dolby Digital soundtracks including Christmas music. For a limited time, the Plasmavironments™ Fireplace DVD is on sale for only $11.95! ON SALE! 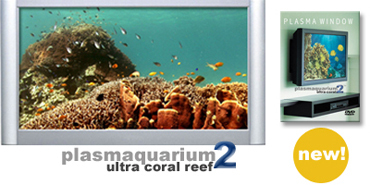 The Plasmaquarium II Ultra Coral Reef DVD. Featuring ELEVEN spectacular underwater Coral Reef scenes. Now the best selling Coral Reef Aquarium DVD available. Works on ALL TVs and in ALL DVD players, including Blu-Ray. *FREE SHIPPING ON ALL ORDERS OF $20 OR MORE.